Since shortly after being nominated by President Barack Obama in 2009, Bonnie D. Jenkins, PhD, has served as the Coordinator for Threat Reduction Programs at the US Department of State. Ambassador Jenkins works with US governmental programmes and international partners to ensure a coordinated approach to threat reduction, security programme development, and harmonised operations. In addition, she is a strong advocate for the Global Health Security Agenda (GHSA) initiative – a collaborative effort among governments, international organisations, and civil society to accelerate progress toward a world safe and secure from infectious disease threats and to promote global health security as an international priority. 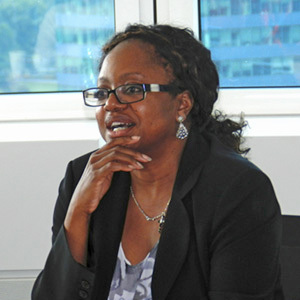 In October 2015, she travelled to Sierra Leone to participate in the ‘Regional Global Health Security Consultation for Laboratory Strengthening’, co-convened by the African Society for Laboratory Medicine (ASLM) and the World Health Organization’s Regional Office for Africa (WHO AFRO), which gathered regional and international health professionals to build consensus around a framework for GHSA implementation across Africa. High-level Ministry of Health officials from more than 20 countries in Africa participated in the Consultation and worked with ASLM and WHO AFRO to develop and publish the ‘Freetown Declaration’ – a landmark consensus document calling for a new framework for tiered laboratory networks, their integration with public health institutes and surveillance systems, and implementation of a score card to assess their readiness to ensure early disease detection across Africa. From your experience in preventing and reducing proliferation of WMD (weapons of mass destruction), particularly in the area of nuclear threats, what lessons do you think might be most applicable to the biomedical community? The number one lesson is to focus on people because you have to have aware and well-trained personnel who can do the work. If you don’t have people, nothing gets done. Secondly, sustainability is important because resources are required to implement GHSA in the laboratory, and a strong and enduring health system needs to be established. Therefore, whatever the situation, GHSA must be incorporated into a system that can be sustained. We need to look at how countries can work together and help each other to sustain programmes. We also need to think across countries, not just one country at a time, and build that into each country plan. Thirdly, we need to find a way to retain the lessons learned during the Ebola outbreak as we move forward. The outbreak highlighted the importance of what GHSA is trying to do: prevent, detect, and rapidly respond to infectious disease threats. The fact that it happened when it did helped to really strengthen the reasoning behind GHSA; it’s unfortunate, but it has given GHSA such clarity. How do you view the role of public health laboratories in the mission of the GHSA? Laboratories are important in strengthening the health system; laboratories are where pathogens of concern are located in an identified space. In the case of biosecurity, for example, we need to ensure pathogens in laboratories are secure. Similarly, regarding nuclear materials, you have to secure the facility where those materials exist to ensure no one with intent to do harm can access them. It’s the same with the laboratory and biological facilities—they must be kept safe and secure. If something gets out of the laboratory that shouldn’t have, you have to go to the second line of defence, which can be more of a challenge: You have to figure out where it is, and get it out of the hands of potentially dangerous individuals. How much risk is there for the supply chain during transport of laboratory materials? Is there a growing threat from outside of the laboratory? We have to ensure the security of the supply chain as it is part of the overall structure of a strong health system. We want to strengthen a culture of safety and security among all those engaged in the supply chain, to mitigate risk and prevent unintentional accidents. We can build fences, or exert some safety control, but it is the individual workers that are going to be using safety and security protocols, so we need to pay attention to them. With biosecurity, culture must be incorporated into education. We fund training programmes when people are out working in the field, but really the education needs to happen earlier. It would be good for ASLM to include both safety and security as part of their training curriculum, to include the supply chain, and coordinate directly with Ministries of Education to implement it. There must be a consistent effort. It is something to include in GHSA national road maps and other strategies for strengthening a country’s heath systems. The Maputo Declaration of 2008, with support from Ministers for Health, catalysed an unprecedented wave of laboratory strengthening efforts across Africa. GHSA and the 2015 Freetown Declaration will spur a second wave focused on real-time surveillance, connectivity, and promoting a more inclusive approach under the One Health agenda. What do you see as the key factors in maintaining momentum? It is critical for the countries themselves to lead this work. The GHSA steering committee, consisting of representatives from a number of countries, is also a way to make sure GHSA goes forward. Each GHSA action package has ongoing coordination in place, and various meetings hosted by countries; the World Health Organization (WHO), World Organization for Animal Health (OIE), the Food and Agriculture Organization (FAO) and others have also taken advantage of existing platforms. The reasons why we had an Ebola outbreak are not going to go away. Risk factors for the spread of infectious disease, such as frequent travel across borders and close interaction between humans and animal vectors are not going away. There will be more diseases, but hopefully we will be better at preventing, detecting, and responding. The Freetown Declaration’s targeted calls for action are an important way to track and maintain momentum for GHSA-focused activities. What do you see as the key take home messages from the recent Freetown GHSA Consultation, convened by ASLM and WHO AFRO? It was heartening to see so many African countries having a discussion and deciding what is best for Africa. It is also good to see a focus on regional or sub-regional collaboration, rather than these important issues remaining at the national level. The meeting was much needed to ensure dialogue and to keep things moving forward. It was good to have the Freetown Declaration document at the end as a concrete takeaway, which will be a great advocacy tool. We have to try to encourage more communication with everyone in government, but it’s not going to happen if it’s not taken seriously. Improving health systems will require perseverance, programming and assistance, assessment of possible pitfalls, and strategy development. This meeting – and the Declaration itself – has shown that many countries in Africa are taking the need for moving forward seriously. This was an important meeting, and a positive effort.